It’s almost fall and that means Halloween is right around the corner – If you love Halloween you’ll want to check out this fun card using the Spooky Treats & Winter Woods stamp sets from the Holiday Catalog. 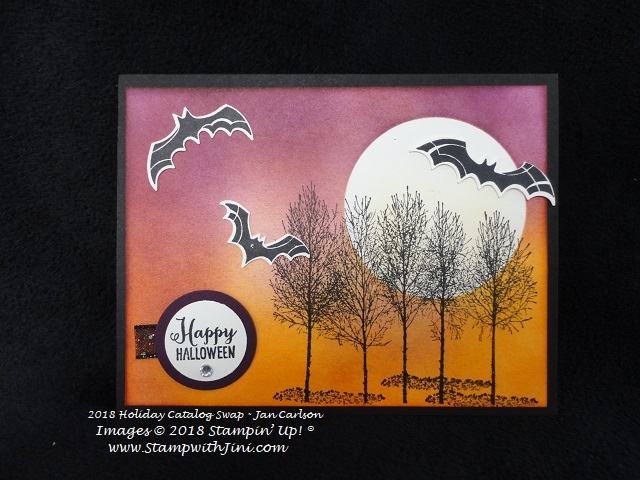 This card uses simple sponging and masking to create a wonderfully spooky fall night! How is it done? First you’ll create a mask using one of the Layering Circle Framelits Dies and a sticky note. Place the sticky note where you’d like it on your Whisper White card stock. Then sponge starting with the lightest color Crushed Curry in a circular motion to begin building the layers of color. Add some Pumpkin Pie and then finish with Blackberry Bliss. Remove the mask and you’re ready to finish stamping. Yep, it’s that easy. Each time you’ll get a little different look based on your sponging which makes it a lot of fun. And if you love this punch you’ll love this tip that Sara shared with us yesterday. 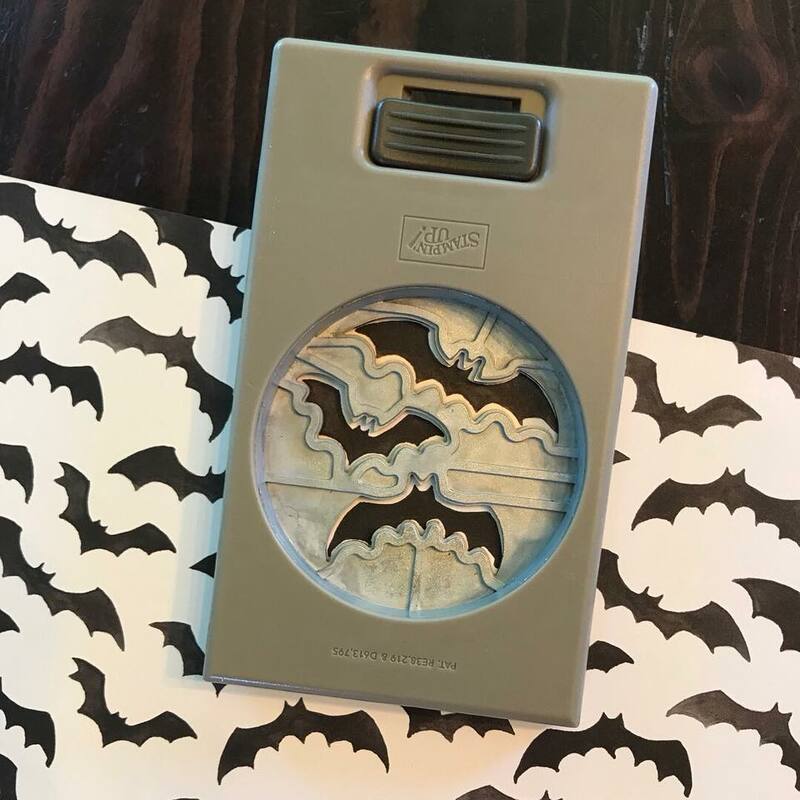 The Spooky Bat Punch (148014) cuts out the bats from the Toil & Trouble Designer Series Paper (147531) bat images! How cool is that? You’re going to LOVE all the fantastic products in the Holiday Catalog! 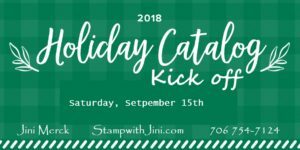 Why not come to my Holiday Catalog Kick Off and check them out? But hurry and RSVP by the end of the day September 12th so I’ll have enough goodies for everyone! Can’t come? or don’t live local and want a catalog? If you don’t have a demonstrator why not email me at StampwithJini@gmail.com your name, address and phone number and I’ll be happy to mail one to you! Love this card? Then you’ll want to stop back by tomorrow when I’ll be sharing some more wonderful cards from a swap I recently hosted. 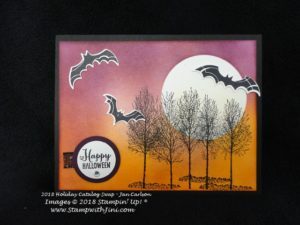 This entry was posted in Cards, Techniques & Tutorials and tagged Halloween, Spooky Bats Punch, Spooky Treats, Technique, Winter Woods by Stamp with Jini. Bookmark the permalink.